Edited by Mlvluu, 24 August 2018 - 08:53 PM. You need to make them get darker. Giving your floor patterns some contrast with the walls will help significantly too. The pattern you're using here uses all the shades in the ramp and is pretty harsh to look at. Just google other examples and study how they created depth. e.g. A hypothetical solution would be to reduce contrast toward the top of the wall (i.e. don't use the darkest or lightest tones of your ramp, and blend the areas where harsh light meets harsh dark). This will (in theory) make it look out of focus, giving you a depth-of-field effect. But as others have noted, the bigger issue here is that a ) the floor is too similar to the walls (hard to see at a glance where the wall stops and the floor starts), and b ) the floor is too high-contrast. Since all your busy action (sprites, blocks, etc.) is happening on top of your floors you can't make the floors themselves too busy or it's overpowering. If you compare LttPs floor colours to the wall colours you'll see they're all much more similar in tone (i.e. lower contrast). This makes the walls stand out against the floor and makes the scene more readable. They're also a different colour which helps a lot too, but isn't strictly necessary. If you're working in the classic set with a limited palette and you can't make the floor colours lower contrast, make the floor texture lower contrast. Use lots of flat colours with suggested details (e.g. Minish Cap) rather than lots of small tiles. Even Z1 had big, flat floor tiles in order to keep your eyes away from it. Because remember, the point of floor is to not be distracting. Keep your visual points of interest to walls, water, objects, sprites etc. ...without making them shrink (or get darker) closer to the floor? Yeah, you've basically ruled out all the best options. There has to be something to differentiate between the higher and lower parts of the wall. If it's not size or color, what's left? As NoeL pointed out, you could angle the vertical lines radially, like LoZ. It's limiting, but if you're okay with only having rectangular rooms, it should work. Maybe decorations would help? Perhaps if you added a bunch of columns and such, and those tapered toward the floor, it would mask the fact that the walls themselves don't. Or maybe they'd just clash horribly. Not sure. I meant without shrinking the walls like in aLttP. As I see it, we all understood what you meant, just that what you're asking is akin to asking 'how do I eat noodles without a fork or chopsticks?'. Sure, you could try and use a spoon, or just go for it with your hands, but forks and chopsticks are the best methods. In any case, you could try some of the other methods suggested (there were a couple which you don't appear to have considered, although if you have and just haven't mentioned it, I'm sorry for assuming that. It would be nice to see some confirmation, though). You have to, in some way, make the bottom look 'further away' from the top, because that's literally what perspective is. Maybe think about what actual walls would look like 'further away'? In many cases, 'shrunk' is right. Depending on where the light source is (maybe not entirely relevant), 'darker' is also right, as would more in/out-of focus. I do have to ask, why don't you want it shrunk or darker? This is a good idea. Not just columns (and they don't have to taper necessarily) but other wall decorations like sconces, tapestries, loose bricks, cornices - if they're drawn with a very obvious top-down perspective this will carry through to the underlying wall. I've created a couple of examples using cornices (and their shadow) and sconces to give depth. The first two rows have skirting around the floor on the wall tiles, which looks nice and uses some contrast to separate it from the floor, but this requires an additional "middle" layer without the skirting if you have multi-level rooms (row 2). You can ditch the skirting and just repeat this "middle" layer for the lower layer if you want to limit the number of tiles you have to work with, or if you want to put the skirting detail on the floor tiles instead (row 3). Oh, and one last thing: I'd try to avoid putting "islands" of wall in the middle of your rooms - especially small ones. It really kills the illusion of depth, no matter how well executed your walls are. If there's a small area you want blocked off, just use blocks or some other decoration instead. For the best depth effect you need to keep your "vanishing point"(s) as close together as possible. If you put an island in the middle you shift your VPs out to the corners, which makes no sense visually (at least not with 1-point perspective, which this is). Edited by NoeL, 26 August 2018 - 07:27 PM. Raised walls, like you have in the middle of your ZQuest screenshot. And maybe it varies per tileset, but they usually look fine when relatively centered. 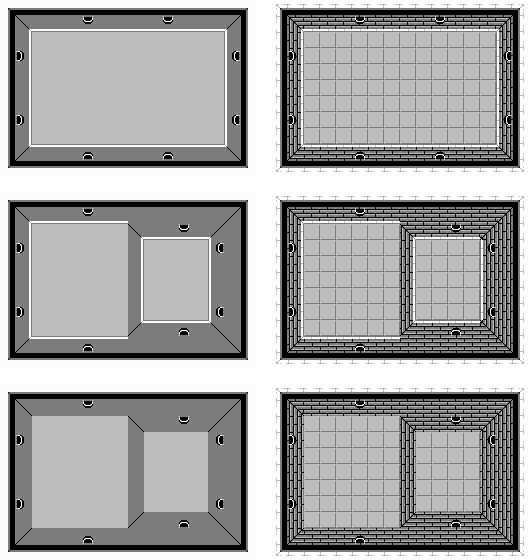 That was just to show the rest of the tileset, though I should just have put them in the corners of the room.